With over 50 athletes, this race was a battle for positions from the start of the race. Tough cookie Lauren ran a fantastic race and was the 1st of our 15 girls home. Despite the field of again over 50 runners (12 of them ours), Robert and Darragh made it to the front and battled hard all the way coming in 1st and 2nd with Evan and David coming in the top 10. A club team prize would have been possible if they had team prizes for this age. A gang to watch for 2019. Órla ran a fantastic race and got out to the front of the bunch. She held well for most of the race, gaining a clear lead with 300 meters to go. Despite a solid performance, a KCH athlete with renewed energy passed Órla with 50 meters to the finish. Órla tried to respond but the other girl fought too and won this time. Órla was followed by Eimear, Ailbhe and Lucy to get the 1st Club team. U11 Boys 1000m – 1st & 2nd Club Team – 2nd Tom Kehoe, 5th Conor Carroll, 6th David McGee, 7th Aidan Keating, 9th James Kelsey, 11th Charlie Ryan, 14th Tomás Carroll, 16th Sam McAvinney,19th Odhrán Prendergast, 20th Adam Joyce, 33rd Eabhan Kehoe, 34th Ross Murray, 36th Conor Malone, 39th Luke Kelly, 43rd Noah Denieffe. Again a massive field of boys with 15 from Gowran AC. Tom Kehoe got away and clear of the group for most of the race with his cousin Joss O’Conor from St.Josephs leading. He finished strong in 2nd and we were all left wondering what could have happened if he had another 500 meters to run. Conor Carroll up in age from U10 had an amazing run and came in 5th with David and Aidan following suit to give them a clear 1st place club team. But we were not finished with that. James, Charlie, Tomás and Sam also ran to the max and won 2nd place club team. The first 12 athletes home are selected for the county team and 6 of those boys were from Gowran. 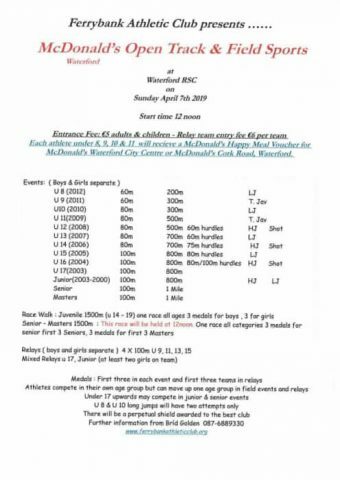 Sarah Kehoe was always the favourite going in to this race after she won the U14 2500 meters last week in Ballycurran. She took a lead early on and was followed by a bunch including Rachel and Hazel. Rachel clinched 2nd in a battle to the finish. Hazel up from U12 finished strongly right behind in 4th. With Ruth Fogarty in 7th, 1st club team was a certainty. Ruairi was a sight to watch today. He took the lead from early on and most probably thought, he couldn’t keep the pace going. But Ruairi has a great engine and he powered through the 2000m to finish first with ease. Newcomer Sam ran a superb race coming 3rd. With Jack and Matthew following, 11th and 12th, the boys got a 3rd club team prize for their great efforts. Maria, Emma, Iseult and Peig all ran strong and got 2nd team prize for efforts. Billy ran a great race again coming 2nd this week but getting stronger with each race. He was followed by Cillian, Luke and Charlie to get 2nd club team. The girls came out in style today taking home 2nd Club team. David, Adam and Diego all ran solid races determined to get a team prize but 4th team member Eoghan Kavanagh got an injury so he reluctantly had to step out of the race. The ladies race started quickly and the athletes set in to their positions pretty quickly with KCH leading the group. First “Gowran Gals” Siobhan O’Dwyer came in 9th position, followed by Emma Cooke and Caitlin Brennan both making their Cross Country debut. Derek ran a great race, coming 2nd, narrowly beaten by King’s River Philip Fennelly. John ran comfortably coming in 7th with Gary not far behind. Kevin and Eamon made their Cross Country debut and had a mighty cheering squad waiting at the finishing shoot!